“Dark Magician” + “Buster Blader” Must be Fusion Summoned and cannot be Special Summoned by other ways. During either player’s turn, when a Spell Card is activated: You can discard 1 card; negate the activation, and if you do, destroy it. This card must be face-up on the field to activate and to resolve this effect. This card gains 500 ATK for each Dragon-Type monster on the field or in either player’s Graveyard. Ratings are based on a 1 to 5 scale – 1 is Horrible. 3 is Average. 5 is the highest rating. Dark Paladin is a strange and unique card in the game. Its place in lore is well cemented by a number of factors. Besides being the monster that took out Kaiba once and for all in the anime, it was also the Dark Magician’s first fusion, which took a surprisingly long time considering Blue-Eyes White Dragon had a fusion super early (although he would get a second one only two months later in Japan – Dark Flare Knight). He was also the first nomi fusion monster ever released. And his materials are still odd to this day. There’s no legitimate way to run both Dark Magician and Buster Blader in the same deck, even with massive support for the former and legitimate support for the latter and even with a number of cards that they share in common. His initial release in Magician’s Force was also strange. The 1st edition of Dark Paladin had a different art than the subsequent unlimited editions. I remember it well, because at the time I was a solo OCG player and I was surprised to see the TCG 1st edition was the OCG Duel Master’s Guide version when it wasn’t supposed to be. It was later corrected. To this day, I believe Dark Paladin is the only card in the game to have a revised art in the same booster. I held on to a copy of each, just because of how strange it was. I’m not even sure why they corrected it, because they very quickly released second and third editions of Dark Paladin with alternate arts. While Dark Paladin has a great effect that holds up to this day, he’s not very playable, which is a shame. And part of this has to do with the unfortunate ruling concerning The Eye of Timaeus. Since the English version of Timaeus can’t be searched by Dark Magician support cards, the spell card is rarely used in Dark Magician decks. And Timaeus can summon Dark Paladin quite easily. If Timaeus had been able to be searched, Dark Paladin would almost assuredly have been a regular presence in Dark Magician extra decks, especially post-link. I’m hoping one day they might reverse this ruling, because it’s quite silly and it’s not even consistent across the globe. In various countries such as Germany and France, the Eye of Timaeus can be searched by Dark Magician support cards due to the linguistic nature of the dialects. I doubt Dark Paladin will be silent forever. Since Dark Magician is the premier co-mascot of the game, even to this day, he will periodically receive new support. And that support could allow Dark Paladin to be playable. Should that day come, a monster that can negate any amount of spell cards will still be incredibly strong. 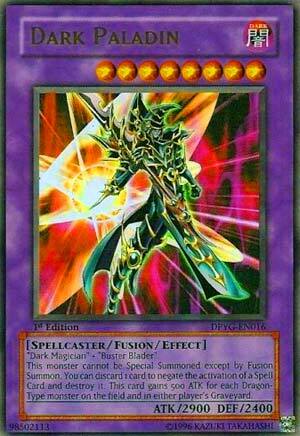 Crunch$G We are going back to the ancient times of the early to mid 2000s Yu-Gi-Oh this week by looking at some cards in celebration of the new Yugi Collector Box, and begin the week with one of the most famous Fusion Monsters in the history of the game, Dark Paladin. Dark Paladin requires Dark Magician and Buster Blader, none of which really synergize with each other to be honest, but this is the type of stuff you would expect from the anime and an old school Fusion, specific materials and sometimes a lack of synergy. With that said, this can be summoned with The Eye of Timaeus thanks to it requiring Dark Magician as a Fusion Material. Dark Paladin has to be Fusion Summoned, but that is probably how you summon it anyways (Timaeus is treated as a Fusion Summon). During either players turn, you can discard a card to negate the activation of a Spell Card and destroy it. I say things like this a lot, but Spell Negation is powerful as always. Why do you think Imperial Order was once banned and had to get an errata? Dark Paladin must be face-up to activate and resolve the Spell negate effect, but I do not think that will be an issue. To give this card some Buster Blader, it gains 500 ATK for each Dragon on the field or in the GYs. If you are playing Dragon monsters or going against Dragons, this can easily get from 3000 to 5000 ATK. Despite the Fusion Materials, which you can get around with Timaeus, this is one of the most powerful Fusion Monsters in the game today. If you are playing a Dark Magician deck and The Eye of Timaeus, this is the first Fusion you should add to the Extra Deck. Today we’re starting the week off with an awesome Fusion Monster: Dark Paladin. Oldie that got some awesome support as of late with the Buster Blader and Dark Magician support, Dark Paladin is easier to summon now than he was years back. Just use The Eye of Timaeus on Dark Magician and straight away you’ve got a Dark Paladin without another fusion material. As always E-HERO Prisma in combination with any bit of fusion support is there. Now we’ve go the Quick-Play Destruction Swordsman Fusion to act as Poly. Now, as a monster, Dark Paladin has a lot going for him. DARK, Spellcaster support, and high ATK and DEF. It’s the ability to negate Spell cards that makes it better. A Magic Jammer as long as you have a card to ditch, Dark Paladin can negate any Spell Card your opponent throws at you. Then there’s the ATK gain. 500ATK for every Dragon-Type on the entire field and in the grave of each player combined can add up to some heavy ATK boost if playing against the right deck or having your own dragons backing you. Even without the ATK boost, the negation ability is so important. Pendulum Monsters get negated, Quick-Plays are shut down, your opponent can’t unload Spell Cards to claim resources to further their strategy. As long as you have the ability to discard, you are in business. It needs its own strategy, but it has the potential now to be a viable option. Art- 5/5- I do prefer the Magician’s Force art more though. Art: 5/5 There are a handful of arts of me, and I like the one best of my midsection zoomed in up with my weapon in hand.